John Bowen (? - 1704) was an infamous pirate that sailed with other known pirates such as Nathaniel North and George Booth. He was one of the famous Pirate Rounders that developed the first Pirate Round. The career of John Bowen was included in Charles Johnson's primary source work A General History of Pyrates and he is believed to have looted over £170,000 throughout his life. Bowen was born on the island of Bermuda and was of Creole origin. He later relocated to the Carolinas and joined aboard an English ship as a petty officer. However, one day Bowen's ship was captured by French pirates and they were forced to sail to the pirate haven of Madagascar. They did not make it to their intended destination however, and ran the ship aground on the south of the island. In the chaos Bowen and the other English sailors took a longboat and sailed about 45 miles or 15 leagues to the settlement of Saint Augustine. 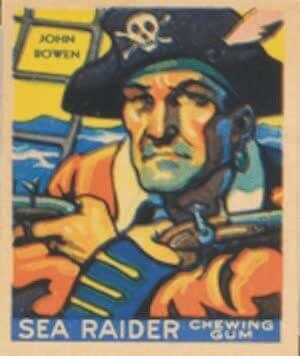 Bowen remained there for 18 months before he decided to become a pirate and joined the crew of a Captain Reed. He was elected sailing mater and their first act was to capture a large Indian ship. The pirates returned to Madagascar and Bowen later signed onto George Booth's crew. In April of 1699, Booth and Bowen captured a 450-ton, 50-gun former slave ship known as the Speaker. It was sometime during this period that Thomas Howard would join the crew. They took the ship and made it their flagship and Bowen would serve with Booth until 1700 when Booth was killed by Arabs at the island of Zanzibar while attempting to negotiate to get supplies. Bowen was elected captain of the ship and continued to pirate throughout the region. Bowen and his crew attacked a fleet of thirteen Moorish ships and captured one worth about £100,000. Bowen then attacked a British East India Company ship that was captained by a Conway off the coast of Malabar in November of 1701. Despite the brazenness of his attacks, Bowen took the captured merchant ship and sailed into the port of Callicoon and sold it in three shares to merchants on the island. Bowen would continue to captain the Speaker until late 1701 when it was lost on a voyage back to Madagascar where it ran aground on a reef at St Thomas' Reef off the coast of Ile de France or Mauritius. Bowen and most of the crew including Howard were able to make it to the island and after three months purchased a sloop and converted it into a brigantine. They named the new ship the Content and sailed to Madagascar where they established a pirate haven named Fort Maratan. In early 1702 the crew of the Content captured a ship named the Speedy Return captained by a Drummond along with an older brigantine that the captain had planned to convert into a slaving ship on the island of Ile Saint-Marie. He was going to sell the slaves to Portuguese cocoa plantation owners in Africa. The pirates burned the brigantine because it was old and useless and they seized the Speedy Return and added it to their pirate fleet. The fleet was not to last long however, as the Content aground on the first night of the voyage. Bowen captaining the Speedy Return did not notice the loss of his companion and continued on towards the Mascarene Islands. Bowen had been distracted by rumors that a ship named the Rook Galley was in the area by former members of Drummond's crew and that it would be a great prize. After unsuccessfully searching for the ship Bowen decided to set course to the island of Ile de France. As he approached the bay there were many ships in the harbor and Bowen did not attack for fear of underestimating them. Bowen took the Speedy Revenge back to Augustin Bay where he met up again with the crew of the Content. Bowen examined the Content and it was deemed rotten and useless for pirating. The vessel was burned and the pirate crews merged aboard the Speedy Revenge. Bowen met up again with Thomas Howard at the port of Mayotta in late 1702 who was now captain of the Prosperous and had his own pirate crew. By Christmas of that year the pirates were partners and plundered throughout the Indian Ocean until March of 1703. In March of 1703 Bowen and Howard captured a East India ship named the Pembroke near Johanna Island, one of the Comoro Islands. After the capture between March and August of 1703 the pirates careened the Speedy Return and stocked up on supplies for another voyage. In August of 1703 Bowen and Howard next met up again and attacked two Indian ships in the Red Sea and managed to capture the largest one. They renamed the new ship the Defiant and burned their previous two ships the Speedy Return and the Prosperous, taking it as their new flagship. During this time Bowen assumed command of the 56-gun Defiant and the crew decided to sail to the port of Rajapura where they would split up their collected loot of around £70,000. Thomas Howard would remain on the island and get married to a local woman. He would remain there until his death at the hands of her relatives for physically abusing her. Bowen continued on towards the Mascarene Islands where he and forty of his crew abandoned the Defiant and planned to retire from piracy on the island of Madagascar. Nathaniel North was given command of the Defiant and Bowen set off on his voyage towards Madagascar. However, he would never make it there and six months after he set out to retire he died of a tropical intenstinal disease and was buried on Ile Bourbon.